Creamer Media’s Real Economy Year Book has been divided into separate reports under the banner Real Economy Insight, and investigates key developments in the automotive, construction, electricity, road and rail, steel, water, coal, gold, iron-ore and platinum sectors. A brief on the pumps sector is also available. 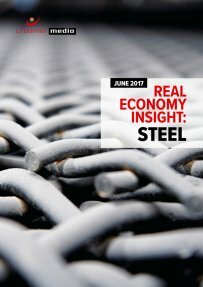 This eight-page brief is a synopsis of key developments in the steel sector over the past 12 months. It provides an overview of the global and South African steel markets, tariff protection, ArcelorMittal South Africa’s steel accord and concerns there with, sector support, the influence of raw materials on the steel price and the long-term outlook for the sector. Published on: 21 June 2017.